Have you been searching for cheap and efficient email marketing services? Then you have come to the right place! HelloMails is a place, where you can get perfect cheap Email Marketing Services on a web-based platform. With our help you will be able to send, monitor and store emails in any quantity from your personal laptop, PC, tablet etc. Our seamless email marketing platform runs like clockwork so that you will forget ever having problems with bulk mailing or email deliverability. Also, we provide a bulk email verifier service, which allows checking all emails out of your customer base to eliminate fake or empty email accounts. No need to test your luck – trust facts! Moreover, our team of professional email marketing specialists is going to help you plan, analyze and run a successful email marketing campaign. Your company will be flooded with leads and website will gain more conversions in no time at all! At HelloMails we have incorporated all main features of opt-in email marketing into one seamless service that supports your connection with loyal customers, raises engagement and successfully promotes new offers. Apart from sending and controlling all emailing processes, you will be able to access all stored data and analyze it with our cheap SMTP server for email marketing. No campaign can be successful without proper insights and figures! While there are lots and lots of Opt-In email marketing companies that tell clients what is wrong with their strategies; we at HelloMails guide you into the world of email marketing and tell you how to do it right. Our service allows you to be in control during the whole process, make corrections, store your data and be sure it’s secure. Track your email progress and develop your business further together with HelloMails! It is a complete Web Based Email Marketing solution. So you don’t need to install or setup any email marketing scripts or software for your email marketing needs. Just Import your contact list, Create or use built-in Email template for your email campaigns and Send or scheduled email campaign. Get your results. Secure, user-friendly email marketing platform, for your email campaigns. 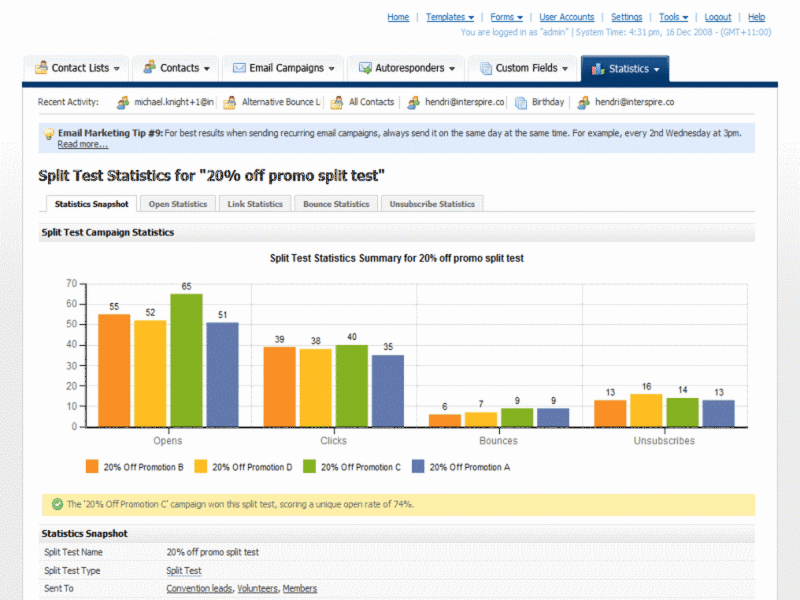 Just start your email campaign, autoresponders, A/B split test without prior knowledge. Lots of amazing features coming with your email marketing user panel. Automatic Bounce Handling ensures to get rid of inactive email address from your list. A/B Split Testing helps you to research about subject and content how performs. Scheduled sending feature helps you to send email campaign even in your bedtime, and lots of features available. Check with the sales team to arrange a demo to know more about our email marketing platform. HelloMails Helps Your Business Blast Off for more leads and customers.